From the moment you arrive, you'll notice the well thought out details of this spacious home. From the comfortable beds, to the fully stocked kitchen, to the small detailed touches, this home has everything you need for an enjoyable stay in Colorado Springs. Spend quality time with family or friends in the game room playing Foosball or a board game - you've got tons to choose from. Have a relaxing movie night while curling up with a blanket and some popcorn and watch one of the many DVD's or Netflix on the 55” HD, internet enabled TV. Cheyenne Mountain Zoo, Manitou Springs, Ft Carson, Peterson Air Force Base and Garden of the Gods. The Air Force Academy is about 20 minutes north. If you feel like whipping up a meal, you've got access to a large, very well stocked kitchen. It's got everything you might need from pots and pans to cookie sheets to mixing bowls...for a more detailed list of what's included see below. To keep everyone comfortable and happy, you've got free WiFi and A/C. There is also huge park across the street for kids to burn off some steam yet close enough for you to sit on the front porch enjoying a beverage while watching them. After a long day of activity, you'll be ready for a good night sleep. There are beds for 7 people, as well as a sofa bed, air mattress and pack n' play. Each room comes with memory foam mattresses, fluffy towels, extra pillows and blankets. Bathrooms comes with all necessary toiletries. Our spacious kitchen is fully stocked with everything you need for meals, all you need to bring is your food. 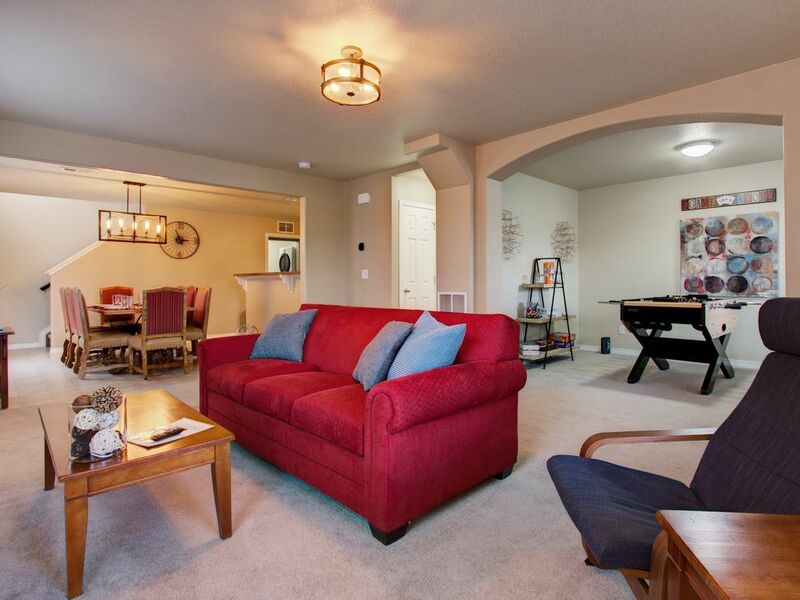 This rental complies with Colorado Springs Short Term Rental Guidelines. Permit #0203. We have grown up and lived in Colorado most of our lives and love it here! We enjoy traveling with our two boys and have found we prefer to stay in a vacation rental over a hotel. It's more comfortable, spacious, allows for cooking (when we want to) and provides a better value for the money. Now that we are vacation rental owners, we have included features and amenities in our home that we have enjoyed on our trips. The best part of the house is the location! It’s the perfect starting point to visit all that the Springs has to offer. Two separate living areas allow for everyone to spread out if they want. There is also a great park right across the street. Quick and easy access to I-25 as well as downtown. There are two full bathrooms upstairs and a 1/2 bath downstairs. Mountain views from master and from the area around the home. Coffee, (and filters) tea, sugar, spray oil, salt, pepper, basic seasonings along with foil, plastic wrap and ziplock bags. Completely stocked with cooking needs, including a selection of pots, pans, serving dishes, Cookie sheets and bread tins. Full set of utensils, serving bowls and plates. Both TV's are internet ready and have Roku along with many local channels. Foosball, checker/game table, board games. We’ve tried to ensure you’re stay is as fun and enjoyable as possible, but if you have any questions while staying at the home we are available by phone or email 24 hours a day. Really enjoyed our stay. Beds were comfortable. Lots of space. The kitchen was well stocked. Seemed to be Allergy free for anyone staying with allergies. This was my second stay and I plan to stay again. Good location. Lots of space. Wonderful beds. Could use a little upgrading. Very nice house. Check in process was great. Very clean and comfortable furniture and bed. Owners were very responsive and helpful. I am planning on staying here again when I am next in Colorado Springs. Just what we were looking for while spending the weekend in beautiful Colorado Springs. We won't hesitate to use again! The home is about 5 minutes away from shopping, restaurants, and many popular attractions.